Nestled in the heart of downtown Los Angeles, the Los Angeles Jewelry District has become an icon in its unique selection of wholesale and designer jewelry. In the past century, the area has expanded and now includes over 5,000 vendors, including numerous ground-level shops on Hill and Olive Streets, and on Broadway between 5th and 8th, as well as several larger malls in the “550” building (International Jewelry Center), the Pacific Center, and the Los Angeles Jewelry Center. Most are historic buildings dating from the early 1900s, interspersed with historic theaters and intriguing architecture. Pershing Square is also a historic park in the area. Not only do shops abound, but this unique “treasure chest” also attracts knowledgeable jewelers from all over the world. The Los Angeles Jewelry District has become renowned for its excellent quality and valuable discount prices, as well as its unparalleled selection of gems, watches, rings, necklaces, and other pieces. Because of its expanse, the prospect of finding anything specific, such as an engagement ring, or loose diamonds in the Los Angeles Jewelry District seems overwhelming. But with some familiarization of proper jewelry vocabulary and how the diamond-shopping system works, you’ll be able to knowledgably wend your way through the beautiful downtown and buy the perfect jewelry piece for the love of your life. Looking at a generic drawing of a diamond, these are basic points with which you should be familiar. 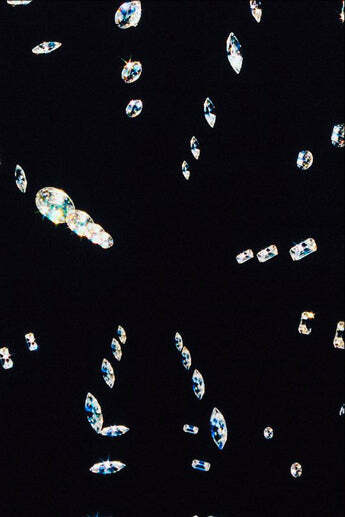 Facets are the little cut, flat surfaces all over a diamond. The table is the widest, flat (top) part of the diamond. The girdle is like a belt: it’s the widest line that divides the diamond. The crown is the top portion of the stone above the girdle. The cutlet is the classic triangular point that lies at the bottom of the tapered stone, below the pavilion. There are four main things to look for when shopping for engagement rings in the diamond district: Carat, Cut, Clarity, and Color. All four of these items are important in impacting appearance and price, and must be considered equally. A fifth C, “cost,” also factors into many buyers’ budgets. The carat (ct) is the weight of the diamond: one carat equals 200 milligrams of the actual weight of a single diamond. Some gems are denser than others, thus, just because one diamond is larger in appearance than other diamond, doesn’t mean it weighs more (has more carats). Carats are made up of points, which can be used to express the weight of smaller diamonds. There are 100 points in a carat. To help picture this division, if you think of it in terms of money, one carat is like a dollar bill, and one point is like a penny (one-hundredth of a carat). For example, a 0.25 carat diamond equals 25 points (one-fourth of a carat). Often it is less expensive to purchase a diamond ring containing multiple smaller diamonds, even if they total more than a carat combined. One trick in purchasing a solitaire stone, however, is to find a diamond that weighs just less than a full carat (say, 90 points, or .9 carats). This gem will cost much less, and the difference in size will be practically imperceptible. The Cut of a diamond does not necessarily equal shape. A cut is essentially all a diamond’s proportions: depth, width, and the uniformity of facets. One important cut is the brilliant cut, which is a characteristically triangular/kite-shaped stone cut to catch the light and shine particularly brilliantly. It includes “round” cuts and “princess” (square) cuts. Step cuts contain fewer facts than brilliant cut diamonds and often make good accent pieces set around or to the side of a brilliant cut. Step cuts include emerald cuts, baguette diamonds (rounded rectangular shape—in the style of a loaf of French bread) and Asscher diamonds (emerald shaped, but cut into a square which sometimes appears octagonal). offers an extensive range of quality and prices. An almost colorless princess cut .5ct diamond costs $738, and an almost colorless round cut .5 stone costs $1,467. These are both greatly discounted Jewelry District prices. They also offer a near-colorless .7ct round gem for $992, and the 1 ct for $4,054. A near colorless Princess cut .5ct stone for $378, while the 1 ct is $2553. An mid-grade Asscher cut .3ct diamond from Modern Design costs $448. $2,000 - $3,500 can garner a small, near-perfect color with few or no imperfections. For example, a 1ct princess cut from Modern Design costs $2553 while a .73ct round stone for $2619, or a .9ct princess cut for $3194. $5,500 - $10,000 is the minimum range for a fairly quality one-carat gemstone. You should be able to find a diamond at this price close to one carat that seems perfect to the naked eye, or a stone just under one carat that are greater in quality. For example, a 0.5 carat stone at this range would be perfect in color, cut, and clarity, but a 1.5 carat diamond would not be as perfect in these categories. $10,000-$15,000 Now we’re talking good quality two-carat diamonds (or a simply stunning one-carat). $60,000 + Because standard settings are sized up to three carats, diamonds in this price range will probably require a customized setting, as this price range will often garner three or more carat diamonds. The Los Angeles diamond district will contain a varied price index, so some online research and shop-to-shop inquiry will help you find the best diamond for the best deal. You are HIGHLY likely to get a better price in person than buying online since many jewelers in the Los Angeles jewelry district sell both wholesale, and retail thus allowing you to oftentimes get a wholesale price for a diamond, basically 20-40% cheaper than buying retail both online and offline. Blemishes are small areas of imperfection on the diamond. Some are harmless, and occur simply because of the natural wear of the stone. Some blemishes, however, will drastically decrease the value and aesthetics of the stone. - A scratch is a fine line on the surface of the gem that can usually be polished away once it is removed from its setting. - A nick is a small chip in one part of the diamond. Some nicks are polished away by creating another facet. - A pit is a small hole within a facet. Pits on the diamond’s table are the most evident, and will diminish the clarity grade and value in a diamond. - Polishing lines are sometimes visible and can be polished away, and are usually less visible on the pavilion than in other parts of the diamond (see diagram). D-E-F / Colorless.G-H-I-J /Almost colorless.K-L-M / Lightly tinted, normally yellow. N-O-P-Q-R / Lightly tinted, normally yellow, as seen to the naked eye. S-T-U-V-W-X-Y-Z / Tinted, usually yellow, may eventually even turn tan or brown once in a setting. Sapphires are becoming more popular as engagement rings, because even synthetic ones are as genuine as naturally harvested stones. They are durable, cheaper, and have more color choices that don’t affect value (blue and pink, for example). You can also think about customizing a ring based on your preferences. You can also now choose the proper band to accompany your gemstone(s). Modern Design Inc (510 West 6th Street #716) is a company well known for their quality and custom jewelry designs, in business since 1978 and they also have hundreds of diamonds to choose from in inventory. Platinum wedding bands use the hardest metal, platinum, are scarcer and thus more expensive. White gold is much cheaper, still durable, and a great color substitute. 14 carat gold (yellow or white) are appropriate for diamonds. Sometimes the solitaire stone can be a tricky accessory for active women or women who don’t like catching the gems on their clothing. Diamond bands (similar to a wedding band, with no protracted setting and stone) are good alternatives. 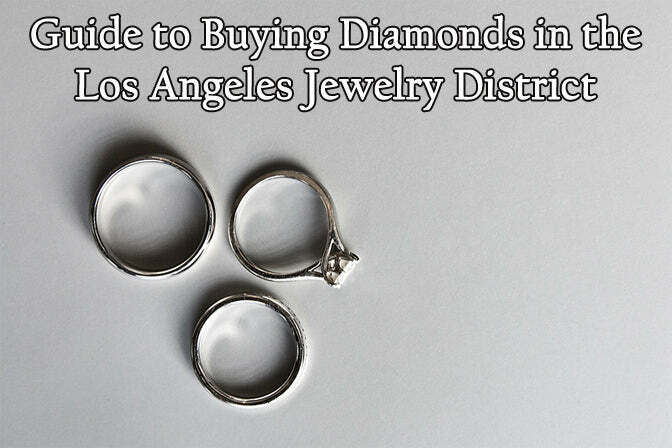 Buying a diamond engagement ring in the Los Angeles jewelry district doesn’t have to be daunting. Preparing yourself with basic vocabulary and checking out a variety of shops in order to compare prices makes a world of difference. Enjoy the experience: it’s meant to last a lifetime. NOTE: Diamond prices may vary as of the time of this writing. Modern Design is a manufacturer and wholesaler of custom diamond jewelry, in business since 1978, and is a proud member of The Jewelers Board of Trade. They have wholesaled their fine line of jewelry to retail stores out of state and now offer their line directly to the public at the SAME wholesale prices. They are located in Downtown Los Angeles in the heart of the Jewelry District at 510 West 6th Street #716, Los Angeles, CA, 90014. If you’re looking to stop by, they take walk-ins Monday to Saturday or you can call to setup and appointment at 213-627-9967.